TASCAM's TH-02 closed-back, stylish headphone delivers a sound you have to hear to believe, and at a low price you can't ignore. TASCAM spent over a year comparing technologies, designs and methods to provide you with an amazing headphone for less than a third of the cost. The sensitivity and frequency response of the TH-02 deliver clear balanced sound to fit all of your favorite tunes, regardless of genre or application. These high-powered headphones produce pristine highs, clear mid-range, and rich low end where most other headphones leave you yearning for more. 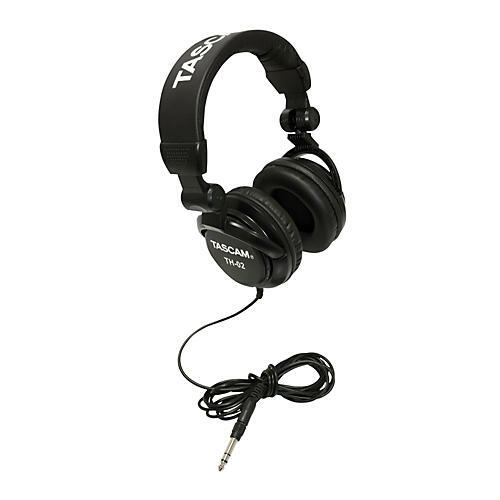 TASCAM understands that just as important as the sound of ones headphones is a clean modern design and comfort. Featuring plush cushioned ear cuffs and a padded headband; TH-02 can be put to work for hours of comfortable use. Both left and right ear-cuffs offer full 90? rotation making TH-02 flexible to wear when listening to your favorite albums, tracking for hours or performing all night. Not to mention, you're going to look good wearing them. The folding design of the TH-02 allows them to compactly fit wherever they need to go. TASCAM's TH-02 headphones can easily be a part of your everyday accessories but also fit into your recording or performing workflow. Don't just hear with any pair of headphones; truly listen to the details of your music and media while enjoying comfort and flexibility. With the TH-02 headphone, TASCAM (as always) has delivered first-class quality, style and design at a price everyone can appreciate. Pick one up today and find out for yourself. Tape machines - 90 day warranty; one year parts warranty.